In Mini Motion, trained instructors help students experience the joy of learning independent of their parent(s) through a variety of stimulating stations designed to help them gain understanding of their bodies’ capabilities and limitations. 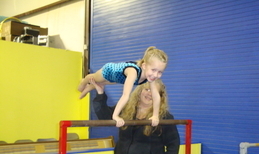 Skill mastery takes a backseat to social learning at this level; however, there is still emphasis on beginning gymnastics skills. At this level, the child is expected to remain in class without their parent. 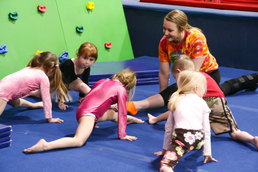 In Motion Movers, trained instructors advance students to more complicated skills (starting cartwheels, handstands, etc) while still focusing on the mind and social benefits of gymnastics. Activities to enhance strength, balance, flexibility and proper form will be introduced in a fun and positive learning environment.